Paying with a credit card online is one of the easiest ways to shop, pay bills, and send money. But what if you do not want to use your personal or business credit card or you are worried that the site you are using is not complete safe? Easy – you get a Paysafecard to help you. 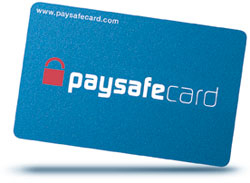 A Paysafecard can help you ensure that any type of purchase or business that you do online will be completely safe. Since Paysafecards are purchased with cash, there is no need to have any credit card information on it at all. Once you use it online, you simply enter in the 16-digit number on your voucher and you never have to enter in one single credit card number at all! If the site is hacked, your computer is hacked or any of your information is compromised in any way, no one will have access to your information at all. The best thing about a Paysafecard is that it acts just like a pre-paid credit card. A Paysafecard is bought with cash, just like a pre-paid credit card, and offers you a 16-digit number that you can use just like a credit card online anywhere that Paysafecard is accepted. You will find over 4,000 sites online that accept Paysafecard, so you can order your favorite things, pay bills, and send money whenever you want. Plus, with Paysafecard, you will be able to feel confident knowing that all of your personal information, bank account information, and credit card numbers are all completely safe. Some pre-paid credit cards out there will convince you to add your bank account or other credit card information to it so you can load that card whenever you need to. However, this only ties it to your personal information so that if it’s stolen, someone can gain access to it. With Paysafecard, you never have to worry about that since everything is done with cash and with a printed voucher. No matter where you go online, Paysafecard is the safest way to shop, pay bills, or send money out of any of the pre-paid credit cards out there.